When Cornerstone and The Chesterfield Food Bank team up, there’s no limit to what we can do for our community! With the help of our awesome Magnolia Lakes homeowners, friends and family, the Food Bank collected an impressive 629 pounds of food this past March! As one of Chesterfields Food Banks’ closest neighbors, Magnolia Lakes (a Cornerstone Homes community) was more than happy to help the organization as part of our continuing efforts to give back to the community! In addition to food donations, we vowed to provide a check matching the total collected food weight at the end of the fundraiser. Michelle Newcome, a Cornerstone representative, presented the $629 check to the food bank which will help feed so many people in need within our community. The additional donation will also help provide the financial means to keep the lights on at the food bank, put gas in their vehicles for Food on the Move and maintain the summer food program, which helps children who relied on school meals have enough to eat all summer long. Cornerstone Homes want to give a special thank you to all of those in our community whose efforts helped us support such a worthy organization and provide food for so many people! 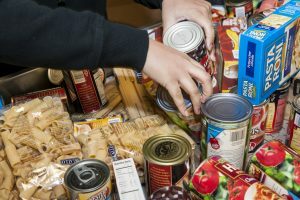 If you’re interested in helping further, the Food Bank is looking for more volunteers to help with their Food on the Move program, delivering food to four local schools, or assist with their food pick up at the Chester, VA location. You can call the Food Bank at 414-8885 to volunteer. You can also continue to make donations through the green donation box in our clubhouse.